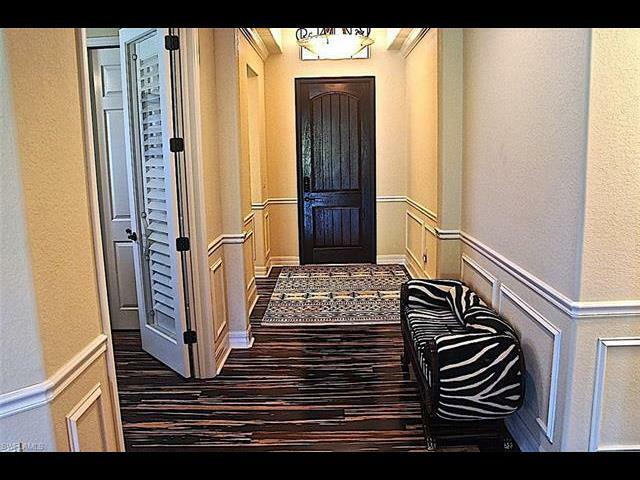 NOT A DETAIL OVERLOOKED IN THIS STUNNING GOLF RESIDENCE SITUATED ON A DOUBLE LOT IN TREVISO BAY. This exquisite 3+den/3 bath home is built in 2014 and shows like a model home. Gorgeous bamboo hardwood flooring in the main living area and guest bedroom, tray ceilings, plantation shutters throughout, crown and wall moldings, stainless steel kitchen appliances with breakfast bar and built in desk, walk-in kitchen pantry, outdoor stainless kitchen with gas grill and more. Resort living at it's finest !! Treviso Bay is an upscale golf community with 2 clubhouses, resort-style pool, fitness center, spa services, restaurants, golf, tennis, walking and bike paths, lush landscaping, 24 hour manned gatehouse and more .. 4.5 miles to downtown Naples and the beach. This exceptional residence is situated on a double lot at the end of the cul-de-sac with an extended paved driveway. Location is serene and private with ample room for a pool. Schedule your showing to view this magnificent home! !